Identification: Variable. Front wing rounded at tip. Upperside is black with red and pale yellow or white bands. Submarginal band of small yellow or white spots; wide postmedian band is red. Underside of hindwing with alternating bands of yellow-orange and cream. Life history: Males perch or patrol all day to find females. Eggs are laid in groups on underside of leaves or on flowers of the host plant. Caterpillars eat leaves and flowers; sometimes using different host plants before and after hibernation. Young caterpillars live in loose silk webs; third- and fourth-stage caterpillars hibernate. Flight: One brood; from March-May at low elevations, June-August at high elevations and in the north. Caterpillar hosts: Various species of paintbrush (Castilleja), beardtongues (Penstemon), lousewort (Pedicularis), owl's clover (Orthocarpus), Chinese houses (Collinsia), and plantain (Plantago). Habitat: From sea level to treeline through diverse habitats including coastal chaparral, meadows, fields, foothills, open woods, alpine fellfields. Range: Southern British Columbia and Alberta south to Baja California, Nevada, Utah, and Colorado. Conservation: Two subspecies, the Bay Checkerspot (Euphydryas editha bayensis) and the Quino Checkerspot (E. e. quino) are listed as endangered under the Endangered Species Act of 1973. 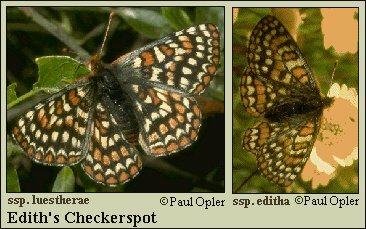 The bay checkerspot (subspecies bayensis) has The Nature Conservancy Global Rank of T1 - Critically imperiled because of extreme rarity (5 or fewer occurrences, or very few remaining individuals), or because of some factor of its biology making it especially vulnerable to extinction. (Critically endangered throughout its range). though it may be quite rare in parts of its range, especially at the periphery.